Welcome to Waldorf A Story Guest Haus. In an effort to answer guest's FAQs and facilitate easier shopping and online bookability for you, we have crafted this first paragraph to our description so you may find the answers you need quickly and enable you to have confidence to book online now. Answer: Our professional software keeps our prices accurate at all times. If you would like to see a quote, simply put in your dates on the website you are viewing and it will present you with an accurate quote. NOTES $25 flat rate pet fee. FAQ 3: What are the bed / bath layouts in this home? Bedroom 1: (Master): 1 queen bed. Bedroom 2: Twin bunk beds. Rollaway Bed: (sleeps one person). 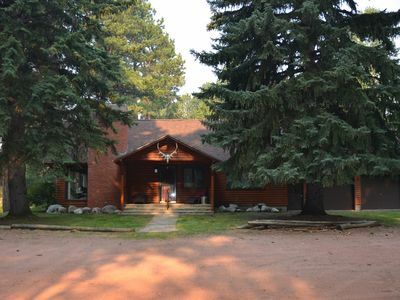 This Guest Haus is located close to many recreational opportunities like hiking, mountain biking, rock climbing and let's not forget the world class fly fishing that our local and mountain streams offer. Stay here and take a day trip to any of the local historic places, adventure opportunities, natural wonders, or cultural activities. This is still the wild west! You will snuggle into your queen size bed in the bedroom that was formerly the wine room and is decorated as such. Our old beer room contains bunk beds covered with old quilts made by each of our grandmothers. There is also extra sleeping for two on the futon and reclining couch. If needed, cots can be provided. Restaurants and a grocery store are within walking distance, as is the Post Office (right next door) so you can mail those postcards back home. The library is located conveniently right across the street for books and DVD's. Our DVD player is also set up to stream from Netflix...even kiddoes movies. 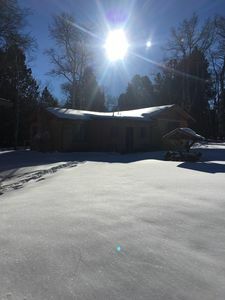 Story is, in keeping with its name, a storybook-like community, nearly hidden by Ponderosa Pines, Hawthorns and greenery in the summer and generally covered in a blanket of snow in winter. You will enjoy staying in this 1,500 sq. foot repurposed old Piney Creek General Store and the Waldorf A' Story restaurant. It's been said that we were a 'place with an attitude'...and that attitude is a philosophy of enjoying the quality of life that Story has to offer. 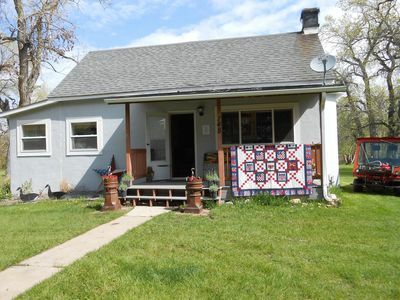 We couldn't let the mystique die, so our previous establishment was re-purposed into this lovely guest haus that is available for year round rental. It has the ambiance of places long ago with worn, rustic floors, rock walls, flagstone dining room floor and a bar built from an extra LARGE Ponderosa beetle killed tree, but with all the modern conveniences. You will also find coffee, and homemade bread and wine. You will take great pleasure from the antiques and all the paraphernalia on the walls which will keep you entertained for hours...as well as an abundance of games. View the sunrise from the awesome huge rocking chairs produced right here in Story while you rock away the hours on the front porch. Sunsets behind the mountains are just as spectacular. There is a stream on the property with places for you to sit and enjoy your early morning coffee...or mimosas. We are close to the Bozeman Trail. Also, you will find Ft. Phil Kearney, The Wagon Box Fight Site, and the Fetterman battlefield, all of which experienced a portion of the Indian Wars. Custer's Last Stand is just an hour away. Hiking and snowshoeing are two ways in which you can obtain exercise and observe the most beautiful wildflowers. Another option is to four-wheel up beautiful Thornerider or Penrose Park. ATV’s are wonderful for exploring historical sites. Winter time allows for snowmobiling. Several events occur year round, but the summer is full of excitement. You will find reenactments of fight scenes and one of the biggest Rodeo's around is held in Sheridan the second week of July every year. This week-long celebration holds fun for everyone. Wildlife is in abundance. Keep your eyes out for all the deer and more! 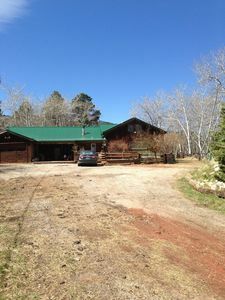 4 Bedroom 2 Bath Mountain Home situated at the foot of the Bighorns. 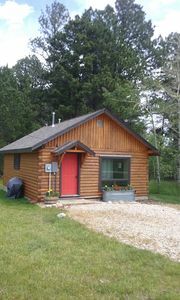 Large, Comfortable Cabin in Story, Wyoming w/ 969 ft. of Pristine Trout Stream!